At the outset of our project we knew that gender would play an important role, particularly given the history and context of the Kiruna mine (also for the Saskatchewan-case). There’s almost a mythology around the miner, a man of few words, with strong hands and a will to take risks in order to get the job done. For sure, many other mining areas share a similar myth. On occasions, we’ve also experienced stories and instances in Kiruna where this myth is reproduced, but the most common example is some sort of ‘light’ version of it, mixed up with more modern discourses on gender, equality and work environment. A lot has also happened since ‘men of high statue’ “founded” the mine in the late 1890s, but there is still a long way to go, as shown by Eira Andersson in her dissertation “Malmens manliga mysterium” (in Swedish, title translated: “The ore’s male mystery”, from 2012; see also the video-interview on gender and mining with professor Lena Abrahamsson on this blog from February 9, this year). Reading Smith Rolston’s book gave a new dimension to gender and mining. 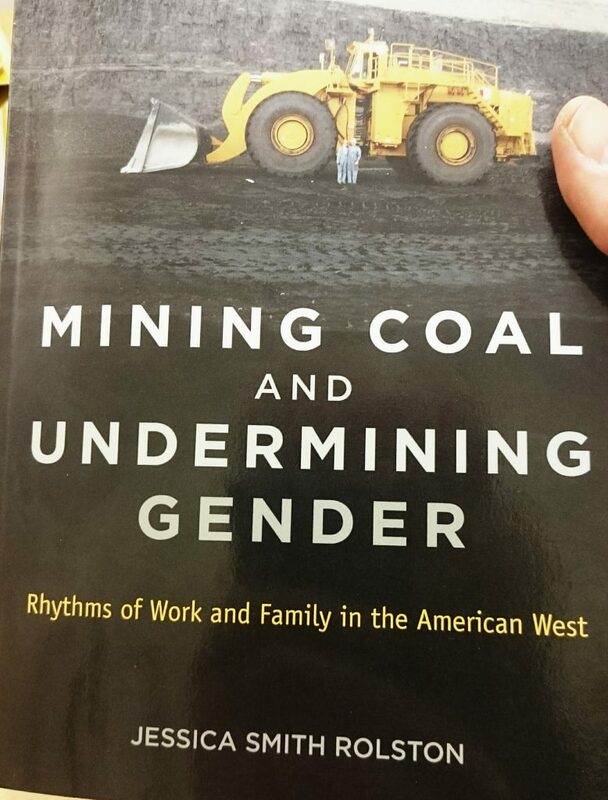 Her in-depth ethnographic study of the coal mines in Wyoming’s Powder River Basin (the largest coal producer in the US) gives a contextual feel for, and a nuanced, almost positive, perspective on how gender is done and undone in the mines. I won’t attempt to cover the entire book here (visit her work-page to access references to her work and reviews of the book), but to share some of the thoughts, hopefully giving you reasons to pick up your own copy of the book! The context, oh the context, it cannot be emphasised enough: it’s always important to ground studies in context. This book makes an excellent case of this. Gender is performed differently in this particular context (as compared for instance with the Appalachian mines, a recurrent comparative case in the book; in Sweden, we often direct our comparisons to Brazilian mines and, not surprisingly, we look quite good). Between 20-25% of those working in the Wyoming mines are women (this is higher than in any Swedish mine!) and this has been the case since the start of the mines in the late 1970s, partly explained by the region’s agrarian history and cultural context where both men, women and youth worked in the fields (making the person asking the question ‘why couldn’t a woman be a miner?’ look rather stupid – of course they can!). Several matters addressed throughout the book are recognisable in our studies, albeit with some contextual differences: great examples on how bodies matter in a gendered labour process (urinating, menstruation etc. ), the rotation schedule and the context of work matter for the family-strong bonds created at work and the juggling act between work and home, being a non-unionised site matter for the relation between workers and workers-managers, enabling well-paid but low education jobs (“blue-collar aristocracy”) matters for the providing of family and for creating the opportunities for the kids to attend university (and thereby avoid ending up in the mines), and much more. I also like the emphasis in the book on how the miners talk to each other, how it matters in order to understand gender performances (the jargong and particularly the humor). One thing I missed was a more elaborative discussion on how career and recruitment were played out in practice, how gender was performed related to these issues. Focusing on the method, the author has close ties to the worksites, the homes and the people, and, hence, to the phenomenon she is researching. It’s an inspiring ‘native ethnography’, making me think of the four days and three nights I spent at the McArthur River uranium mine in Saskatchewan. I left with the feeling of only scratching the surface of ‘what’s going here’, writing the lyrics for our song “Wolfpack” (on our Production album) on my trip back home. Reading Smith Rolston shows the benefits (as well as some of the challenges) from truly engaging with the field, even when it includes family. Her father works in the mines she’s studying and she has also worked their during Summer, later spending a lot of time on site as a researcher. Epistemologically, the way she approaches the phenomenon is very interesting, enrolling all senses, on site, in order to understand gender performances. The empirical material is unique, giving me a feeling throughout the book of getting to know the people, their work-ethic, work culture, and how they balance work and family with a tough rotation schedule. This approach also create strong bonds with several of the persons studied. The author mentions that this creates a responsibility of not jeopardising their trust by painting outsiders (such as me) “negative portrayals” of the miners (which seems to be a common type of portrayal in the US according to the author; I think of a fiction book I read last year where this is the case, on Appalachian coal mining, “Grey mountain”, by John Grisham). This is an issue of representation, of how to communicate findings from the study that are scientifically interesting and relevant, while not necessarily being in agreement with, or seen as positive by, those studied. This balancing act goes on throughout the book and although the author is very transparent about it, I’d sometimes liked to have seen a more front-loaded treatment of issues-with-friction. A feeling that occasionally came back throughout my reading was that although particular performances of “gender neutrality” could be argued, some of these nevertheless took place on an already gendered stage (there’s no “ungendered” space). In lack of better words, this meta-level of analysis could have played a more important role in some sections. I also lacked a more thorough treatment of the wider context, missing a deeper analyses beyond the local context, on the overall market context for the coal mining and how this is perceived by the miners. This also goes for the growing importance of sustainability issues, particularly the climate change debate and the role of coal in the work towards sustainability. It’s understandable that locals focus on the local context and natural environment, and that they take good care of it, loving their outdoors, but I imagine that they also have thought about, for example, climate change related to their work and off-work life. That is, just as much as I enjoyed reading about how the miners reflected on how people outside the area didn’t understand the importance of the coal mines for the supply of electricity in the US (a miner is quoted: “Half of every lightbulb in the U.S. is lit by coal… but a lot of people can’t think behind the wall”, p 31), I miss how they in turn reflected on how their idea of how work and place matter when focusing on how mining coal also risk undermining other places and people (past and future).